What is The Gorilla Hut? That was not the first question. We were just looking for work, and decided to follow a lead provided by Peter�s and Julia�s cousin, a guy who had been there for three months a year before us. We exchanged a couple of texts with this Damon person and he said he had arranged with an orchard for us to do some apple picking. The only thing we knew is that we had to take the �Tamahere� exit in between Cambridge and Hamilton. Still there we went! I heard some chattering behind a plastic courtain. English accent. I went through it and there were two guys dressed in cakis and workboots: �Damon�s not home right now, but he knew you�ll be arriving any moment. So he should be back soon. Just get yourself comfortable mate.� And so we waited, but not for long because a couple of minutes later we heard a car parking outside. The man, in his forties, walked towards us with a smile in his face and a big hand to be shaken. He showed us around and then took us through a field where a cow grazed peacefully and some piglets were feeding. We arrived then to the farm house. It was the place where everyone gathered to have dinner, a meal that Damon cared to cook every day, and also where we chose to sleep. The house reflected the spirit of The Gorilla Hut. One could say it was messy, or even dirty, or that the owner had no respect whatsoever for order. It was what hell would look like for your mother. But I prefer the word chaotic. Chaos is what humans try to seize, try to control, it is also what we fear. We love to impose an order into a world we believe to be ours. We build monstrous cities where we feel protected and things make sense, we put names on things, we believe that there is a place and a purpose for everything. 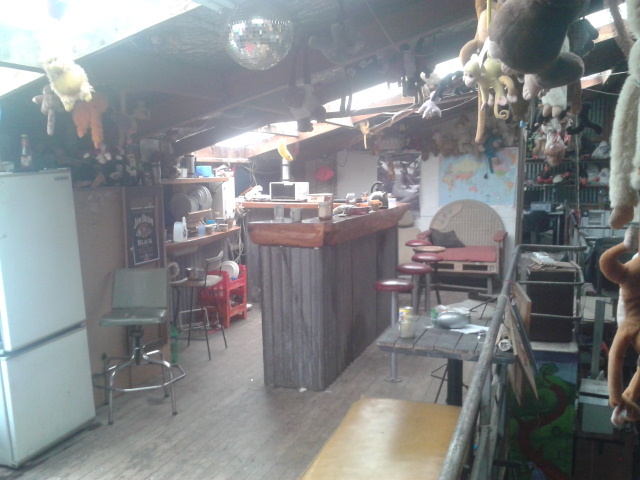 So when you arrive in The Gorilla Hut, you feel something quite different. And you get a reminder that sometimes is better to �Let the chips fall where they may.� Sometimes you have to abandon yourself to the situation and enjoy the ride. The apple picking work was not good. They paid $32 per bin and in one day you were lucky to fill two of those. The heat was overwhelming because of the drought. And last but not least, in apple picking it�s more difficult to talk to some co-worker since you take care of a row of trees and are constantly climbing up and down the ladder searching for the god forbidden fruits. But nonetheless we chose to stay, because we had the chance to be in one amazing place. Date submitted: 26/05/2013 11:28:02 p.m.